In rugged beautiful high-altitude country about 245 kilometers southwest of Lhasa is the ancient town of Gynatse where there are annual athletic contests on the fourth lunar month of the Tibetan calender. 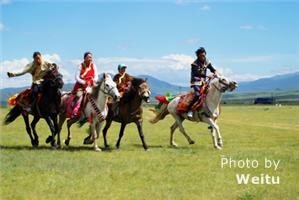 These contests involve horse racing and archery contests, as well as wrestling, Tibetan Opera, music and dancing, track and field, and ball games. Along with this, there is a swap meet and an open market to buy authentic Tibetan crafts goods and a picnic where you can try the Tibetan food. The town of Gyantse is situated in a valley between high mountains, and compared to the rest of Tibet, more of the traditional way of life continues on there. The valley itself is at an altitude of about 4,000 meters or feet. In the plain outside the city, a tent city springs up each year as villagers in the region arrive for the festivities. The athletes and artists compete and have a good time on a plain that has a lot of blooming flowers at that time of year. Watching the festivities and competitions may be an enjoyable highlight of a trip to Tibet in July, and a visit to the nearby town will be interesting too. In addition to the horse races, you can watch the yak races. Yaks are a species of bovine related to oxen. That must be fun to watch. There are also weightlifting contests and Buddhist worship ceremonies. The festivities, ceremonies and contests last four days. One thing to be prepared for is the high altitude. 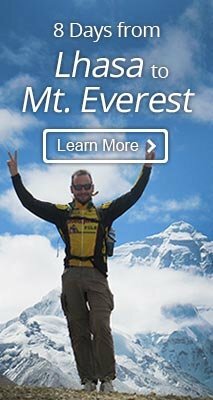 4,000 meters or 13,000 feet is an unusually high altitude, so even just relaxing for more a few hours may be tiring for a lot of people. So if you plan to stay for a day, be prepared for high-altitude sickness. Walking around the tent camp area or touring in the city may really tire you. However, looking at the flowered fields and seeing the scenery is one of the highlights of a visit to the competitions. The main places of interest in the town of Gyantse are the Kumbum Stupa and Palkhor Monastery. The Kumbum Stupa is the only Nepalese-style stupa in Tibet. It was an important center of the Sakya tradition of Tibetan Buddhism. It is situated in the Palkhor Monastery on the northern side of Gyantse. It is one of its kind in Tibet, and the architecture is unusual and interesting. The Palkhor Monastery is quite different from other monasteries of Tibet. It was built in 1418 and has been remained relatively unscathed. It is the only monastery that houses monks from different orders. The monks from the Gelugpa, Sakyapa and Kahdampa orders are in this monastery with apparent harmony. The main assembly hall of the? Palkhor Monastery called Tshomchen was built between the end of the 14th century and the beginning of the 15th century. It is a three-story structure. The ancient artwork at the monastery is renowned among scholars. There is a statue of Maitreya Buddha that is eight meters tall and contains 1.4 tons of bronze. There are tens of thousands of images of Buddhas and deities all over the place. The Kumbum Stupa is one of the most distinctive temples in the world. It is an unusual Tibetan architectural masterpiece, and its nine levels rise in the manner of a stepped pyramid. Its construction started in 1418, and it was completed in 1427. This structure is 35 meters tall and has 9 levels. It is designed to be a 3-D mandala; a place that as the monks walked around in it they learned about Buddhist teachings and could be enlightened. However, many of the original images were damaged or destroyed during the Cultural Revolution, and they were replaced with the current clay images. It is still considered one of the most outstanding and sacred places in Tibet. See China Highlights tours to Tibet. It is said that the Gyantse Horse Race festival started as an athletic competition in the 1400s. As the years went by, it became an important inter-village competition. Buddhist worship and other events and festivities were added in. Of course, if a lot of people from various villages get together, they need to eat together peaceably, and they’ll have a picnic. They’ll also swap merchandise and have a swap meet, and a market will start as people come to try to sell their merchandise.